You can support Eryn Rosenthal and The Doors Project by making a tax-deductible donation HERE through New York Live Arts, Inc., a 501(c)3 tax-exempt organization. The link will route you to New York Live Arts’ online form where you can make a contribution via your credit or debit card. If you would rather write a check to support the project, please be in touch HERE. Thanks very much for your support! I look forward to hearing from you. Puede apoyar a Eryn Rosenthal y The Doors Project (El proyecto de puertas) AQUI con una aportación a New York Live Arts, Inc., una organización sin ánimo de lucro. Esta aportación se puede descontar de la declaración de la renta en los EEUU. El vínculo de arriba le llevará al formulario de la organización para contribuir al proyecto con su tárjeta bancaria. Si prefiere escribir un cheque estadouidense para apoyar al proyecto, por favor póngase en contacto AQUI. ¡Muchísimas gracias por su apoyo! No dude en ponerse en contacto conmigo, y contarme cómo le parece el proyecto. 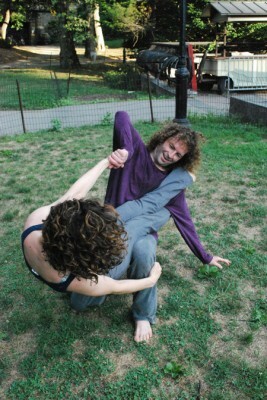 Photo credit: Eryn Rosenthal and Ralf Jaroschinski, by Rob Sanchez.